Thought I'd post some of the ideas behind the animation style of the film, both for my own personal keeping and your personal amusement. It helps getting it down on paper just to see if it makes any sense outside my head, and adjust myself to it whenever I get lost. 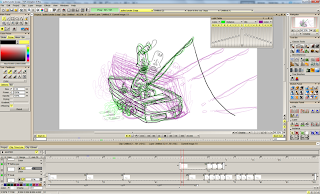 I use TVPaint for the animation, and After Effects for the composition (putting backgrounds, sound and animation together). I've already worked with AE in the past, but TVPaint is a new experience. 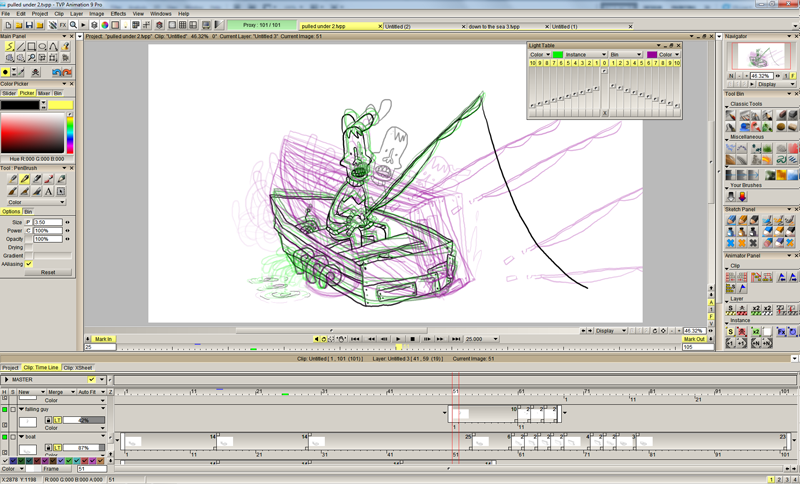 It's nice working with a program that's created specifically for 2D animation, in contrast to e.g. Flash or AE/Photoshop cut-out. It relies heavily on doing frame-by-frame, helping out by making it an absolute headache to just move an object around the screen! (or I'm just too stupid to figure out an easier way). A screendump of the workspace. I don't usually work with the light table on full (the green lines represent earlier frames and the purple those to come), but it sure makes it look pretty business. 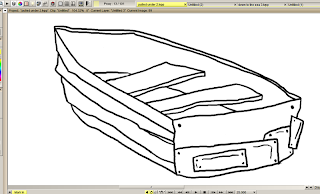 As a stylistic (and practical) choice, I'm keeping the lines uneven and wobbly. 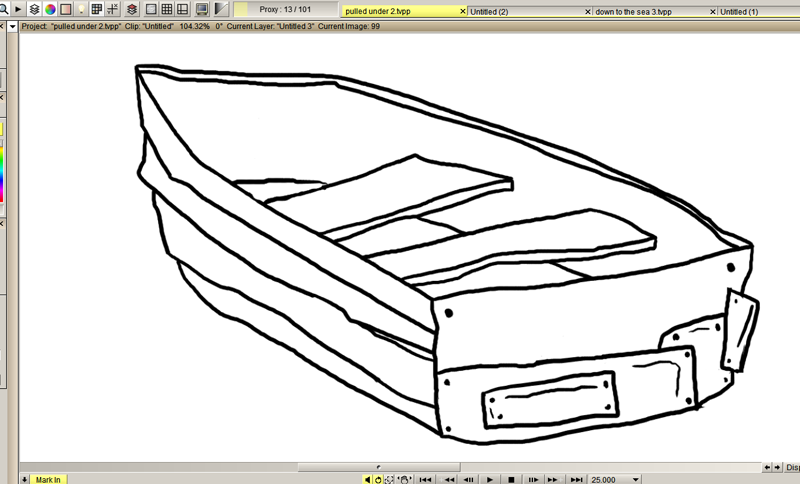 The animation will be just as crude as the lines. I steered away from Flash because I'm not a huge fan of the smoothed brush lines there, and not that confident with the pen tool. Superjail!, which is made in Flash, pulled this off superbly. You can really see the fun the animators had and the results speak for themselves. Creating something good that looks like it's been thrown together then and there takes talent, and I'm in general a big fan of Augenblick even though they're not involved in the show anymore. There's been a tradition among several ancient tribes and religions to put at least one mistake in their craftsmanship to symbolize the imperfection of man, because only (the) God(s) is/are perfect. I don't want to directly associate my movie with ancient wisdom of the divine, but at the same time I kinda really do. To sum up the stylistic choices with a comparison to a garage band: It's messy, noisy and not that technically impressive, but it sounds fun and you can't really hear if they're good or not because of the lo-fi recording equipment. I've gotten the best results so far by just "messing around", so I'm trying to steer as much as possible in that direction to keep it interesting. That's my excuse, at least.